Eight Whitworth singers earned a total of nine awards in the classical voice and musical theatre categories when Whitworth hosted auditions Nov. 13-14 for the National Association of Teachers of Singing. More than 160 students from universities across Eastern Washington auditioned in the Inland Empire Chapter of NATS. In addition to Whitworth, singers hailed from Central Washington University, Eastern Washington University, Gonzaga University, Walla Walla University, Spokane Falls Community College, Washington State University, Whitman College and Yakima Valley College. Senior Mollie McComb received two awards, taking first place in musical theatre and second place in classical voice. Senior Ellie VerGowe took first place in classical voice. Freshman MacKenzie Covington, junior Tyler Kruse, senior Mac Merchant and freshman Kirsten Mullen all received second place in classical voice. Sophomore Ira McIntosh took second place in musical theatre, and freshman Jordan Kingma earned third place in classical voice. Scott Miller, director of voice studies and assistant professor at Whitworth, serves as the NATS audition chair. Miller credited Whitworth's strong performance at the competition to the students, voice faculty and pianists. He described the students involved in NATS as talented, hard-working, dedicated and receptive. The Whitworth voice faculty features excellent teachers who use their professional experience to help students, he says. And the pianists, who had to perform about 30 songs apiece, collaborated well with their students and essentially represented half of every performance. The singers were students of Whitworth voice professors Patricia Blankenship-Mortier, Marjory Halvorson and Scott Miller, and were accompanied by staff pianists David Brewster, Beverly Rhodes and Mary Trotter. The National Association of Teachers of Singing Inc. was founded in 1944 and is now the largest association of teachers of singing in the world. Today, NATS boasts more than 6,500 members in more than 25 other countries around the world. NATS offers a variety of lifelong learning experiences to its members, such as workshops, intern programs, master classes, and conferences, all beginning at the chapter level and progressing to national events. 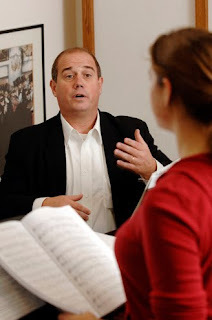 Scott Miller, NATS audition chair, director of voice studies and assistant professor, Whitworth University, (509) 777-3382 or smiller@whitworth.edu.